Even Kurt Cobain admitted that "Smells Like Teen Spirit" was a cheap Pixies ripoff. Although Cobain grave the Pixies the gratitude they deserve, most Nirvana fans haven't even heard of them. And what a shame that is, because The Pixies are a million times better than Nirvana. Buy Doolittle. Buy it today. for "once" i agree with lucas. got this on my 18th birthday, along with midnight vultures, this album still inspires me to this day. the pixies are one of the greatest bands ever, and although beck has kinda left me cold lately, i still love this band. this album is okay for a while. but i got bored off it after a while. i prefer nirvana . best song monkey goes to heaven. 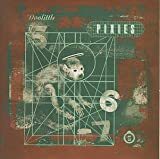 With this follow up to the ground breaking Surfer Rosa, the Pixies unleashed a rabid suburban tasmanian devil onto the hair sprayed streets of popular rock. The "unremarkable looking" quartet screamed, moaned and feedbacked their way onto alt rock radio with a sound that changed the future of rock. Catchy hooks sandwiched between chaos, driving beats supporting simplistic, straight forward baselines, this is what rock and roll should be. From the addictive anthem Debaser to the perfect pop sound of Here Comes Your Man, Doolittle is one of the most fearless albums out there. Lyrics, like the music, range from nonsensical to sublime. Frank Black balances hollers with harmony. Kim Deal's voice will make any guy smile and remember that "girl next door" he had a crush on in junior high. Joey Santiago redefines what a guitar can do. And David Lovering's druming shows proof positive that you don't need to hit 30 drums per second to be an amazing drummer. To miss out on Doolittle is to miss out on rock history. There's something here for everyone, and for the first time listener, it may take a few listens for it to click, but when it does, that click comes as an explosion. This is one of rocks finest hours. A true must have.